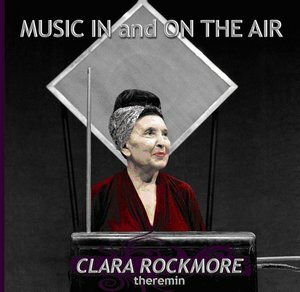 Theremin World - A New Year and a New Clara Rockmore Album! 2012 could not begin with more exciting news than that of a new CD of theremin performances and interviews with Clara Rockmore! The album "Music In and On the Air" comes out Jan. 1, almost 31 years since it was recorded when Clara appeared on The Listening Room program on WQXR Radio in New York City. The Nadia Reisenberg - Clara Rockmore Foundation has been working for months to digitally remaster the old reel to reel tapes and launch the CD to mark the end of Clara's centenial year. In these never before released recordings, Clara Rockmore performs solos and chamber pieces with her sister and renowned pianist Nadia Reisenberg, the violinist Erick Friedman, and members of the Violincello Society. The detailed liner notes include never before seen letters and photos of Leon Theremin and Clara. This important new theremin CD is available from Qualiton and is released by Romeo Records. Congratulations to the Foundation and Bob Sherman, host and producer of the radio show and the CD release. Have a Happy Theremin New Year and treat yourself to this very special album.